General Motors Canada has warned about 300 workers who manufacturer Chevy Equinox transmissions in St. Catharines, Ont., they will be laid off soon if the automaker and union can’t reach a new contract at the CAMI plant in Ingersoll, Ont., by the end of the week, Unifor Local 199 said. St. Catharines Powertrain supplies CAMI with transmissions for the Equinox, but production in Ingersoll halted when 2,800 Unifor members struck the automaker late Sunday after the labour contract expired. 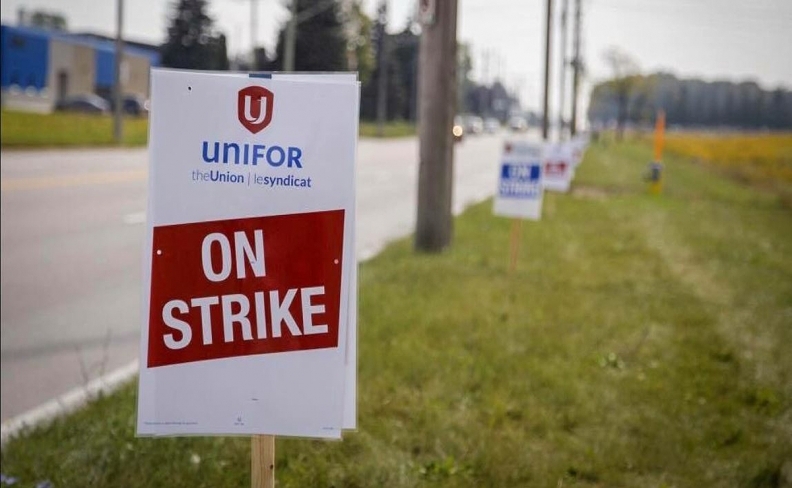 Unifor Local 199 Chair Tim McKinnon said GM has been running the St. Catharines line all week, stockpiling transmissions there as the strike continues in Ingersoll, about 150 kilometres away. GM Canada didn’t immediately respond to questions about how the St. Catharines operations would be affected by the strike at CAMI. McKinnon said about 90 per cent of the transmissions made in St. Catharines are shipped to CAMI. He estimates the factory is stocked with enough parts to continue running two shifts a day through Friday. “But come Monday morning, there will be 300 people laid off if there is no deal [in Ingersoll],” he said. McKinnon said his local supports the strike in Ingersoll. Local 88 says the main sticking point in the dispute is that GM Canada refuses to designate CAMI the lead Equinox plant among the automaker’s North American facilities. Two plants in Mexico began assembling the Equinox in April. The crossover is built on a line alongside the Terrain at the Ramos Arizpe plant, which also builds the Chevrolet Cruze and Sonic on another line. GM’s San Luis Potosi plant also builds the Equinox, along with the Chevrolet Aveo and Trax and the GMC Terrain. GM could ramp up production in Mexico during the strike, but by how much is unknown. Borthwick on Wednesday said Unifor and GM Canada informally spoke over the phone again, but no progress had been made. “We realize other people will be affected, that’s why we hope we can come to an agreement soon,” Borthwick told Automotive News Canada on Wednesday. Canadian parts giant Magna International has already stopped shipping parts to the CAMI plant. Magna wouldn’t say how many facilities are affected or whether its employees are still being asked to report to work.